As summer draws to a close, so to does the U.S. government’s temporary relaxation of passport rules for air travelers going to or coming from Canada, Mexico, Bermuda, and the Caribbean. 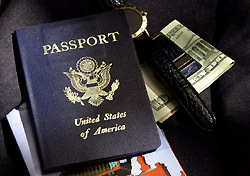 As reported by Travel Weekly (registration required), all airline passengers will be required by the Department of Homeland Security to have a passport for travel between the U.S. and all international destinations starting October 1. In June, the State Department temporarily suspended its passport requirements for travelers to foreign countries in North America who had applied for a U.S. passport but not yet received one. The State Department’s inability to process passport requests in a timely manner due to an overwhelming influx of applications prompted the relaxation. It’s hard to say whether the State Department got its act together over the summer. Will passport applications be processed in the usual six weeks, instead of the 12 weeks some citizens were reportedly waiting earlier this year? My suspicion would be no. I would recommend that if you need a passport for upcoming travels, you apply as soon as possible and expect to wait at least a couple months. Read Airfare Editor Jessica Labrencis’ tips for more details about what you can do to make sure your passport arrives before your vacation.